When planning work, effective planning involves assigning the correct amount of work. 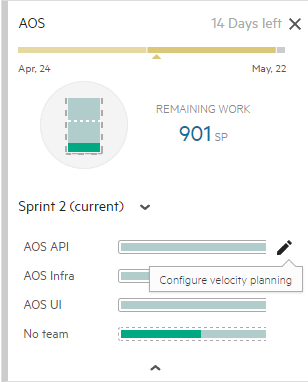 In ALM Octane, each team has a release and sprint velocity, which helps determine the release capacity. In parallel, you estimate each user story, quality story, and defect in story points. Using these estimations, create optimal work plans by assigning the correct amount of work for the available capacity. Velocity is the expected amount of work to complete during a specified period. You measure velocity in total story points. Velocity is an over-time calculation. This means that you calculate the velocity for your team by looking at completion over time. If a team increases the amount of work finished, then the velocity increases. Likewise, if the amount of work finished decreases, the velocity goes down. In ALM Octane velocity is the default for a team's workload. You assign each team a velocity as a starting point for all planning. Capacity is the actual amount of available time for work during a specified period. You measure capacity for a team in story points. You measure capacity for an individual team member in hours. Capacity is a calculation based on a specific, finite period. Capacity is a dynamic measure according to manpower and availability changes. In ALM Octane, you adjust capacity for each release and sprint. This lets you plan the releases and sprints for the available resources and time. Estimate what you think your team can complete in a sprint (based on past performance). For details on setting the default velocity, see Adjust a team's expected velocity per sprint. For each sprint, edit the individual sprint velocity. If your team has variable work rates, edit the expected capacity for these periods. If you do not see the team member buckets, ensure you select a release, sprint, and team in the module filters. In the Details tab, update the Estimated velocity value. In the Velocity tab, update the Available in Sprints value and the Expected Velocity column. 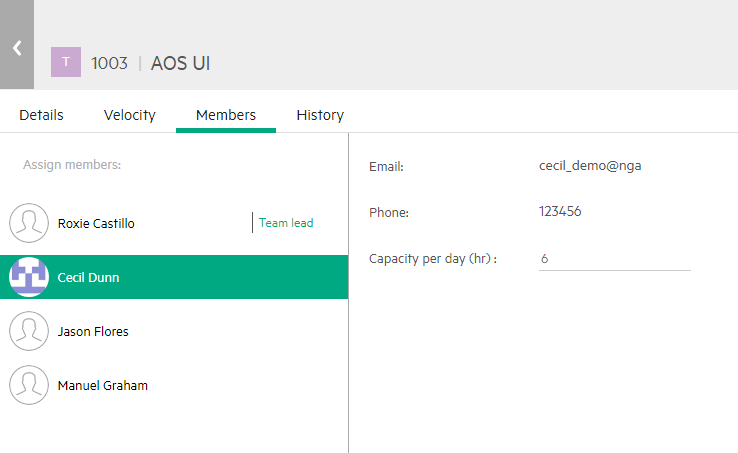 In the Members tab, update the Capacity per day (hr) field value for any team member. Assign stories to a release and sprint to fill available capacity. For details, see Plan your release. As you work, track the progress of each release, sprint, or team. Compare the actual work completed against the expected work completed. The yellow line indicates the actual velocity average (in story points) across sprints. ALM Octane calculates this average from previously completed sprints. You are managing a team working on the development of an online shopping application. Your team is assigned to the first release with four members. How do you plan your team's velocity and capacity? There are 3 sprints in this release, each 2 weeks long. Each person can achieve 1 story point per day. Each person is available for 5 days each week, for a total of 10 days per sprint. Each person achieves 10 story points per sprint. During the release each team member can complete 30 story points. As a result, the team can achieve 120 story points. This ensures you do not exceed each member's available work time and jeopardize their progress. As you work, monitor the actual progress by comparing the expected velocity vs. the actual velocity, using the Velocity Tracking widget in the Dashboard.